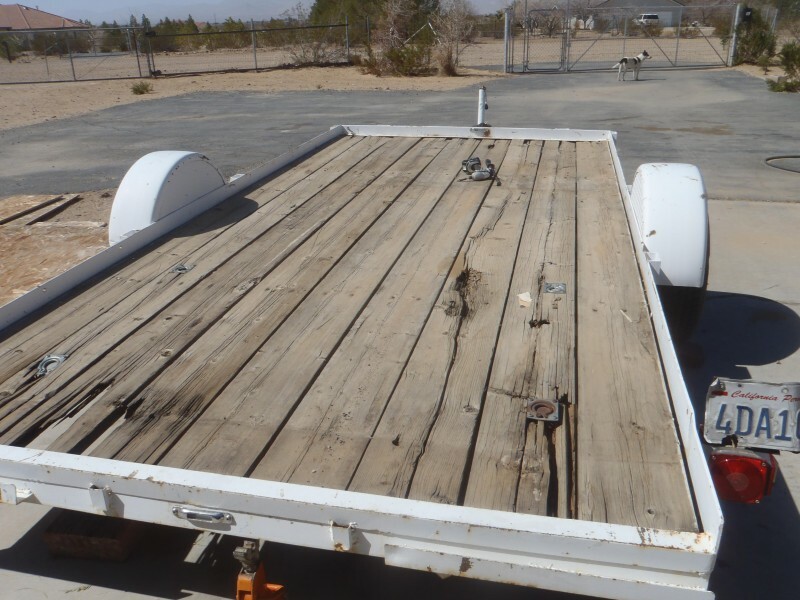 I have an old fourteen foot flatbed trailer that was in bad shape. My dilemma was; do I fix it or just give it away. I do need it, fourteen feet is a good size for my side x side, dirt bikes or any of the 100 other uses that come up. After a little thought and some price checking it was decided to rebuild it. First was to pull all the old nasty wood out, remove all the wiring and lights. Now with just a bare frame it was a good time to paint it. We got a quart of white Rust-Oleum and rolled the paint on instead of using spray can. My painter (Vickie) feels we get better coverage and less waste when rolled plus you can still use a spray can in the tight spots. I had already picked up a lighting kit so it was easy to run new wires now that all the wood was out of the way. Cutting all the wood to size was easy, the only problem is finding straight pieces at our local Home Depot. 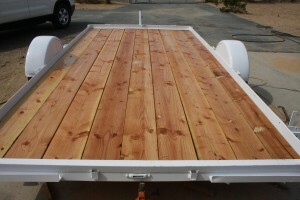 I put in the wood at an angle and beat it into the proper position under the metal edges at the front and back of trailer. I then used new carriage bolts to hold it in place. This was all good until the last piece which I had to cut a little shorter to make fit. I then used one extra bolt to hold it in place. 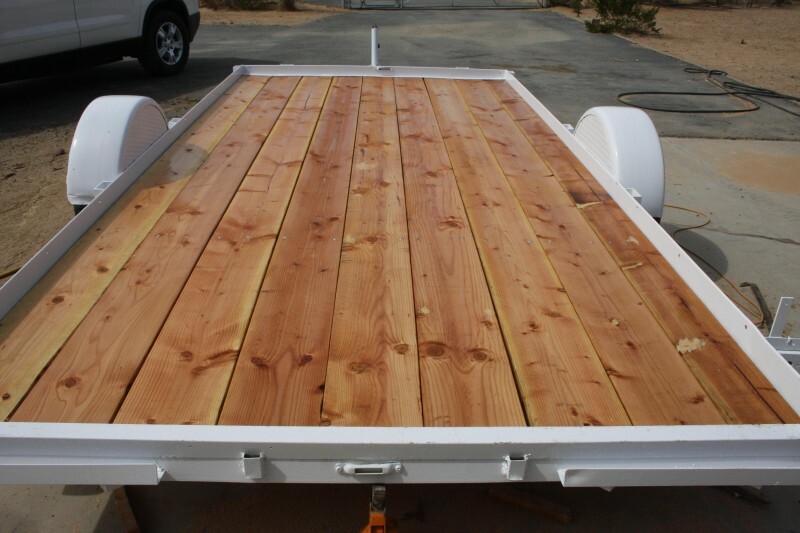 Now that the trailer was respectable it was time to seal the top of the wood (we sealed bottom before it was installed) in hope that it would last for a long time. I was real happy with the way the trailer came out and I was glad that I spent the $250 to fix it. So I thought…………..
After using it a couple times I started seeing marks in the wood and knew if it wasn’t handled the life span of the wood would be shortened. 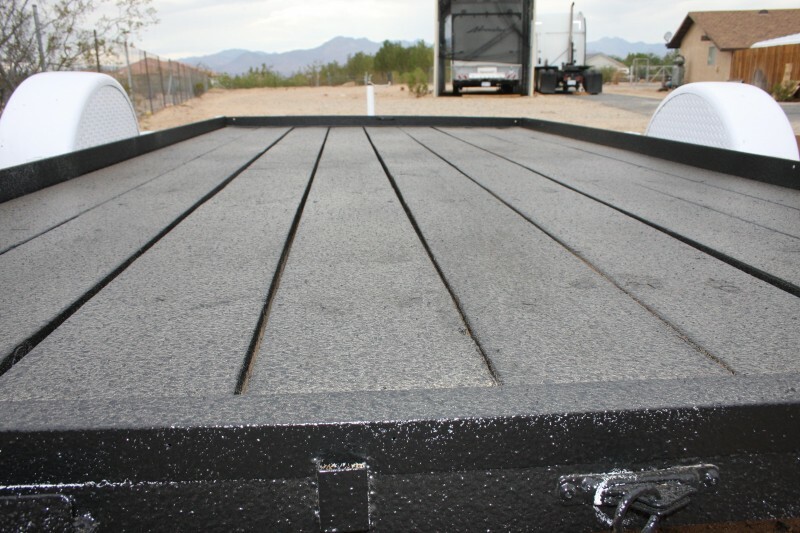 Just as luck would have it I received an e-mail about a do it yourself hard liner that would work on wood and metal. So I started researching Al’s Liner DIY Truck Bed Liner Kits . I was a little intimidated at first about installing a product like this. I thought you would need special tools. The only thing that most DIY’ers wouldn’t have is a hopper,(which Al’s sales) the air compressor, air regulator and prep tools are common tools to most home mechanics. My other concern is I didn’t want it to look like a cheap fix like some I have seen. I checked the website, read the history and watched the Al’s Liner Training Videos and decided to try it. I got two kits, a hopper and some rubber crumb, to help with traction, from Al’s Liner. First thing was to read the directions a few times and wasn’t real impressed with them. One thing it said “Primer” on container but the directions were calling it “Adhesion Promoter” I felt better about the tips I got on-line at Al’s Liner DIY Bed Liner FAQ maybe I was over thinking it because once we finally got the nerve to start it was real easy. We did clean, mask and prep everything real good. We mixed up a whole patch of Al’s liner but only put in half at a time to make the hopper easier to handle. Another note is when I put the hopper together I put the handle on the back so it would be easy to hold, but that allows the hopper to spill materiel when you bend over to spray. So put the handle on backwards (which the video shows) and it will be the better way to avoid spills. Once the liner is mixed you only have 20 minutes before it starts to set-up so make sure everything is ready before you mix the components. 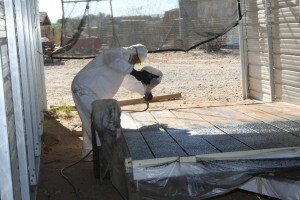 Vickie did get some coveralls from the paint department at Home Depot and wore a respirator to apply the liner. The hopper made the application real easy and the liner went on like she had done it a bunch of times. It was very user friendly with a professional look. The only complaint she had was judging the thickness as your applying. The trailer looks really rugged now and I am glad we did it. I took a sharp rock and threw it at the liner and didn’t even leave a nick. 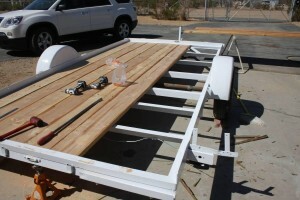 Will do the same for our old flatbed. November 24, 2015 -- Are All Locks the Same?